Or Yehuda, Israel, August 15, 2013 – Formula Systems (1985) Ltd. (NASDAQ: FORTY) a leading provider of software consulting services, computer-based business solutions, and proprietary software products, today announced its results for the second quarter of 2013. Revenues for the second quarter ended June 30, 2013, increased 8% to $201.2 million compared to $186.1 million in the same period last year. 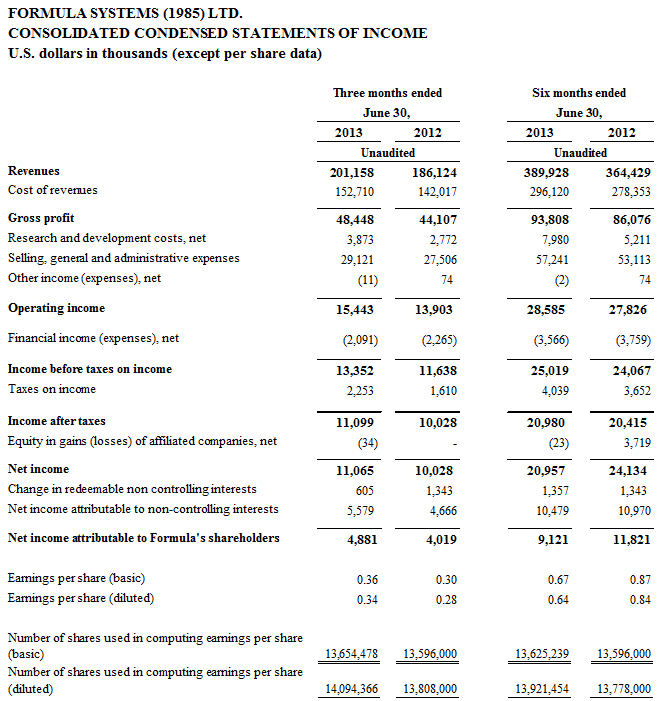 Operating income for the second quarter ended June 30, 2013, increased 11% to $15.4 million, compared to $13.9 million in the same period last year; Non-GAAP operating income for the second quarter ended June 30, 2013, decreased 1% to $17.7 million, compared to $17.8 million in the same period last year. Net income for the second quarter ended June 30, 2013, increased 21% to $4.9 million (or $0.34 per fully diluted share) compared to $4.0 million (or $0.28 per fully diluted share) in the same period last year. Non-GAAP Net income for the second quarter ended June 30, 2013, increased 2% to $6.1 million compared to $6.0 million in the same period last year. On June 10, 2013, we declared a cash dividend in the amount of US $0.37 per share and in the aggregate amount of approximately US $5.5 million paid on July 2, 2013. Revenues for the six-month period ended June 30, 2013, increased 7% to $389.9 million compared to $364.4 million in the same period last year. Operating income for the six-month period ended June 30, 2013, increased 3% to $28.6 million compared to $27.8 million in the same period last year; Non-GAAP operating income for the six-month period ended June 30, 2013, decreased 3% to $34.5 million compared to $35.5 million in the same period last year. Formula’s consolidated cash and short term and long term investments in marketable securities totaled approximately $127.2 million, as of June 30, 2013. 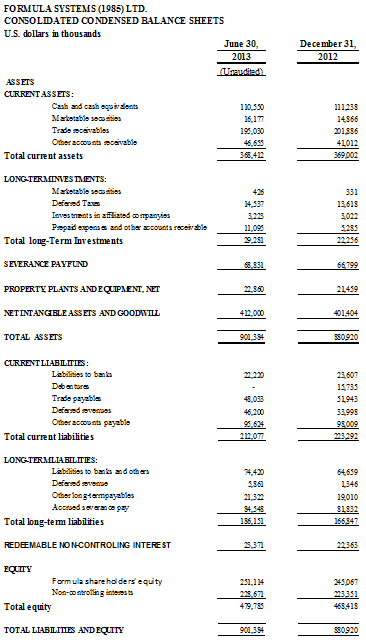 Total equity on June 30, 2013 was $479.8 million, representing 53% of the total balance sheet.